Whether you want to download the 250+ games to your machine or enjoy fast instant-play pokies, Casino.com has it. Part of the Mansion Group of casinos that also includes Les A Casino.com and Mansion Casino, Casino.com is a gaming site Aussies can really trust. The casino is owned and operated by ONISAC Ltd and licenced in Gibraltar. If you're worried about what the software is like, major players Playtech are on-board to provide industry-leading games and pokies. Whether you want to download the 250+ games to your machine or enjoy fast instant-play pokies, Casino.com has it. Also, they also cater to the burgeoning mobile gaming market with a solid mobile option for Android and iOS devices. Let's take a closer look at the Casino.com engine and see if the gaming site is ready for its Roadworthy certificate. Why mess about with drongo sites that offer paltry $100 bonuses when you can take advantage of one totaling $3,200? That's what is on offer with Casino.com. OK, to be fair the total is made up of a first deposit of $400 max, but there are several more reloads allowed to make a grand total of $3,200. After Aussie players have made their first real-AUD deposit you'll have 30 days to action the bonus, but check the site's play-through requirements first. Casino.com actually requires a 40x wagering amount, and while many leading casinos have this, it's still pretty hefty and way above the 30x requirement you will find at rival sites. Pokies fans, start celebrating; table games nuts start looking elsewhere as roulette and the like are excluded from any bonus allowance. Tuesday is 'Reload Day' at Casino.com. Opt in during the game week and you can benefit from a 25 % bonus when you deposit that day. Make a minimum deposit depending on your loyalty level and you can claim up to $400 each and every week. VIP players can get a maximum bonus of $750. Obviously, there's a catch, namely the 7-day deadline to play through your bonus amount. VIP players are well catered for at Casino.com with a variety of incentives. Loyalty points are earned every time you play, with Bronze (0-499 points), Silver (500-2,999pts), Gold (3,000-20,000pts) and VIP Elite (20,000+) the tiered levels. The more you play, the more bonus cash and benefits you earn, but players must keep up the wagering limits to remain in their tiers. VIP and VIP Elite players reload deposit minimums are $100 as opposed to the usual $50 but the maximum bonus also increases from $400 to $750. Standard VIP features like a personal account manager, invitations to exclusive live events, and faster cashout times, are also available. Regular morsels like 10 % cashback offers over the month and Christmas points leaderboards are nice added bonuses to a site that likes to mix things up a little with its promos. Perhaps the nicest added touch is a straight Refer a Friend promotion which rewards you with 50 bucks every time a mate signs up and plays through a 40x wagering requirement. You can even take advantage of those bonuses on a mobile device. Casino.com's smartphone and tablet app, which is aptly called Casino.com Mobile App, is designed to make receiving welcome bonuses as easy as possible. Actually, the entire app is top-notch. Play at Casino.com with your $3,200Bonus Now! While not as loaded as other leading casinos, Casino.com nevertheless boasts more than enough gambling action to keep even the most casino-weary Aussie happy. There are over 250 gambling games available to play for real cash, with lots of Playtech pokies and tables games on a Mac or a PC. When you are playing on an Android or iOS device, you have access to about 20 games. Fans of Marvel pokies will love the Playtech titles like The Amazing Spider-Man and The Incredible Hulk. The Marvel games are all tied to the special progressive Marvel Jackpots so you can play great pokies while gunning for jackpots worth hundreds of thousands. Remember, the wagering requirement of the bonus is 100% on the pokies, so those Marvel games suddenly seem much more attractive. Players have the option to download the casino client to their desktop or enjoy some quick Flash instant play games wherever they are. iOS and Android players are well catered for too with decent mobile casino action. Although not included on play-through allowances, Casino.com nevertheless offers some bonzer table game action in the form of blackjack (seven different varieties) and roulette (a ripper nine variations available). There's even a great casino school where you can brush up on your table games rules and skills. 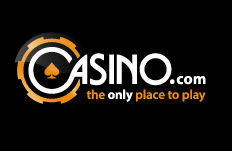 Casino.com offers the full range of online Live Dealer games like Roulette, blackjack and even Mini-Baccarat. These games are like online casino games with the added attraction of playing against - and chatting to - a real-life croupier. The range of variations here is pretty impressive. These days, many online casinos offer mobile apps and Flash-based browser games to Android and iOS users so they can play on the go. Some are even available to Blackberry and Windows Phone users. More and more online gamblers are starting to play on their smartphones and tablets. It is a booming industry, which is not a surprise at all, given the convenience and flexibility it offers. As long as your phone or tablet is connected to a secure Internet network, you can open up the app and start placing your bets in a matter of seconds. Online casinos have absolutely no qualms about spending thousands of dollars to create secure user-friendly apps for their players because this is a great way to attract new players and to get existing players to gamble more often. So let's talk about the Casino.com app! Which devices do you need in order to use this app? Does the Casino.com mobile app offer as many games as they do on Casino.com? No. The website offers at least 250 games while the app offers only 20 games. However, there are still a wide variety of games, including the most popular games, European roulette, blackjack, pokies, video poker, and scratch cards. In a typical mobile casino review, Casino.com's app is rated as what? Excellent. A number of factors, including customer service, design, bonuses, and the user-friendliness of the app makes it a well-made app. If you read any mobile casino review, Casino.com is usually rated amongst the top online casinos when it comes to apps. If you are an iPhone or iPad user, you can download the app at the Apple store. Just do a search on Casino.com. If you are on an Android, then simply head over to Google Play to download the app. The app is available to everyone who accesses Casino.com directly. You can play right on the browser without downloading anything. Open up the site in your mobile device. Register at Casino.com by clicking the green “Join Now” button. If you already have a Casino.com account, log in by clicking the orange “Log in” button at the top right corner of the page. Select your favourite game and start playing! Don’t forget to have Flash activated on your mobile device! Casino.com accepts all of the following currencies: AUD, USD, EUR, GBP, CAD and ZAR. But for Aussie customers, the benefits of playing at Casino.com come in the wide range of deposit methods they can use. Australian favourites like POLi, VISA and MasterCard are accepted, along with e-Wallets like Skrill for totally anonymous casino gambling. Withdrawal times are quick (one or two days at most depending on your method) but VIP and VIP Elite Aussie customers benefit from faster cashout times than mere mortals plying their pokies trade online. There are some huge maximum deposits offered at Casino.com, so the high rollers amongst you will be pretty pleased. Check the site and you'll see the trusted security logos in place. Casino.com has some top-drawer encryption in place to make sure your deposits and withdrawals are kept safe at all times. Casino.com is a global brand accepting players not only from Australia, but also from many European, South American, and Asian countries, as well as South Africa. Casino.com supports 46 languages. Customer Support can be accessed 24/7 via live chat, phone or email to answer any questions or concerns. The instant chat was quick and agents friendly, and they were able to quickly deal with the range of problems we threw at them.